Home Unlabelled ShopClues Launches Dual SIM 4G VoLTE Most Affordable, Swipe Konnect Star exclusively! ShopClues Launches Dual SIM 4G VoLTE Most Affordable, Swipe Konnect Star exclusively! 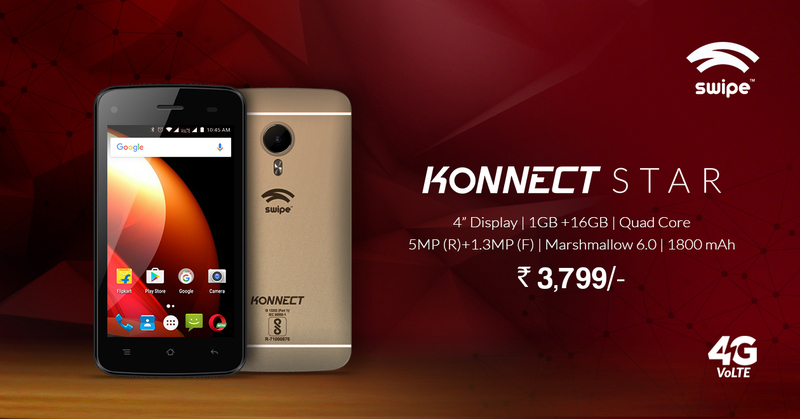 New Delhi, February 16, 2016: Shopclues, India’s first and largest managed marketplace has exclusively launched the Swipe Konnect Star smartphone on February 16. The stylish new smartphone boasting an elegant design along with premium features is available on the e-commerce platform at an unbeatable price of INR 3,799. ShopClues is India's first and the largest managed marketplace with more than 100 million monthly visits on its website and was founded in July 2011. With 5cr listed products and over 5,00,000 merchants, ShopClues aims to provide the best online shopping experience to its customers - starting from the great selection, low price, ease of use, fast delivery, and ending with the best customer service you have ever experienced. ShopClues ships in over 29k pin codes across India and has thousands of online stores.